產品介紹:12 Combo 10/100/1000M/SFP L2 Managed Switch (SMG-4000-120CC)-明泰科技 Alpha Networks Inc.
Modular fan and dust filter design. Jumbo Frame up to 13,312 bytes. Support Ethernet Ring Protection Switching (ERPS). Support 802.3ah Link OAM, 802.1ag, ITU-T Y.1731 Service OAM. Inter-operating with IPv4 and IPv6. Support Power Saving function on Gigabit ports. 12 Combo 10/100/1000Base-T/dual speed SFP ports. An RS-232 console port on the front panel for configuring the software features. 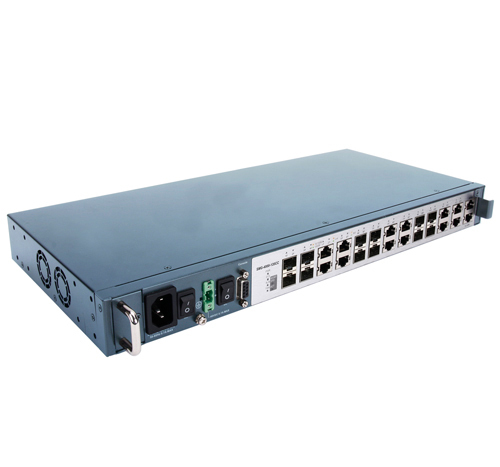 A 10/100M RJ-45 Ethernet management for IP-based out-of-band telnet, Web or SNMP management. An RJ-45 port with 4 pairs of alarm circuit for external alarm detection. One AC & one DC power, each power input has individual power switch.